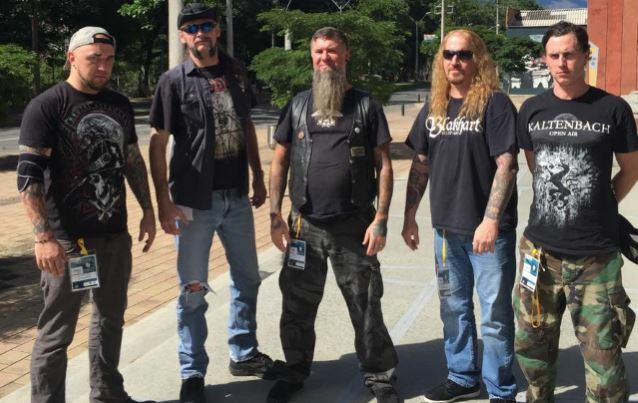 Florida death metal veterans MALEVOLENT CREATION have completed work on their twelfth album, "Dead Man's Path", due later in the year via Century Media. MALEVOLENT CREATION vocalist and founding member Bret Hoffmann previously stated about the band's new record deal: "I am very excited and extremely pumped to be signing and working with Century Media! I believe we will finally get that push we need to really get our music out there!! "It feels great to have the guys at Century Media believe in us and our new songs, and really want to stand behind them and the band, and push us forward to bigger things! I mean, I think we have always been a bit underrated (I hear that from a lot of fans too) and I really think with this signing, we have a great chance to boost this band up!!! It's also a pleasure to have drummer Justin DiPinto back in the fold! He brings the hungry aggressive quality this band has always had back to the forefront! "When we played three weeks of festivals and shows in Europe in August, it felt great!! That aggression was feeling strong!! 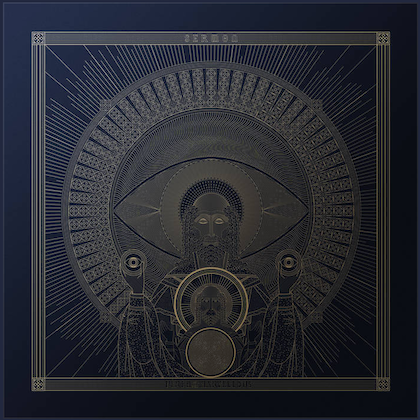 "Looking so forward to playing MANY shows after this album hits the street!! Speaking of which, we are currently working on the new slab! It is coming out intense and heavy as HELL!! Everyone is killing it! "I think everyone is just so determined and hungry to bust out the heaviest music and ideas we can with this one!! Great heavy grooves will not be missing, I promise!! "With this signing to Century Media and the new ripping album being done, I see great thing happening!! So with that being said, we will soon be unleashing the malevolence all over the world!!! We will be pounding stages and eardrums into oblivion and hope to see you all out there!!! Let the slaughter commence!!!!" Added MALEVOLENT CREATION guitarist and founding member Phil Fasciana: "I couldn't agree more with Bret's comments concerning signing with such an established record label (Century Media) and having the confidence of knowing we are working with a company that believes in our band's music and will get it distributed worldwide properly. "Along with guitarist Gio Geraca, bassist/founding member Jason Blachowicz and returning drummer Justin DiPinto, we no longer have the word 'compromise' associated with band and its music. We have had more than enough time to write, re-write and perfect our new material and deliver it the way we want for ourselves and fans. "We are very excited to be working together on our 12th album and look forward to its release on Century Media and will be wasting no time on getting back on the road and touring extensively around the world to promote our band and new album. "Nobody knows what the future holds, but the five of us are all committed to delivering the heaviest MALEVOLENT CREATION album to-date and look forward to the future and working with Century Media Records worldwide." Said Philipp Schulte, Century Media A&R Europe: "When my colleague Stefan Franke and I were asked about our opinion about signing MALEVOLENT CREATION, my thought was if this was a rhetorical question. "MALEVOLENT CREATION have never ever wimped out. They never tried to go mainstream nor have they ever delivered a weak album. (Don't mention 'Stillborn' here! The album still slays, no matter what you think of the production) and they know how it has to be done. So the answer seemed pretty obvious to me. "We have received a lot of positive feedback throughout the last couple of years on our signing policy for extreme metal bands, be it newcomer bands or big established names. MALEVOLENT CREATION belongs to the latter group and we think they just perfectly fit into the Century Media roster. We are very proud having them on board. The six demo tracks we have heard are brilliant, offering all the well-known trademarks on a very high level. Seeing them live and meeting the guys at Party.San Open Air was a pleasure. We saw a veteran death metal band in perfect shape, all five guys fully committed to the band with the focus on working on an album with the potential to become a classic in a catalogue abundant in classic albums." Stated Dan Dismal, Century Media product manager/A&R USA: "Being a MALEVOLENT CREATION fan AND having the privilege to hear a handful of their new material made this an easy decision for me... Yes, yes and YES!! And come on, it's MALEVOLENT CREATION! Who wouldn't be stoked to work with one of death metal's most viable institutions!?"